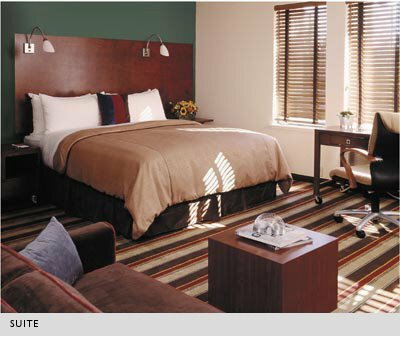 This is the hotel where Keith is living during his six weeks in Mountain View, and the room really does look like this. I think it's great for him to be staying in a hotel room that looks like the kind of studio apartment you'd actually look forward to coming home to, instead of a crappy beige standard business hotel room. And there's an excellent bus service, and an Albertsons right across the road and an In-n-Out Burger just up the road. All in all, it's a good spot to be in. There's also a very swish looking hi-fi lounge full of the kind of furniture I WANT TO HAVE. We discussed the fact that we're just not collectors. We don't have the stick-to-it-iveness that accumulating collectables requires. If we did, we would have bought that wonderful 1950s table and chairs in Halifax for $150 and paid to have it shipped back home. But we didn't. Maybe I can get Queenie to do it for me. In-n-out, In-n-out, that's what a burger's all about. I hate you both! I saw it the other day I think! So it's still in the shop. I wondered at the time why you didn't buy it, but you were busy. I'll do it for you no probs if you like. I know exactly where the hotel is.